Oh boy! 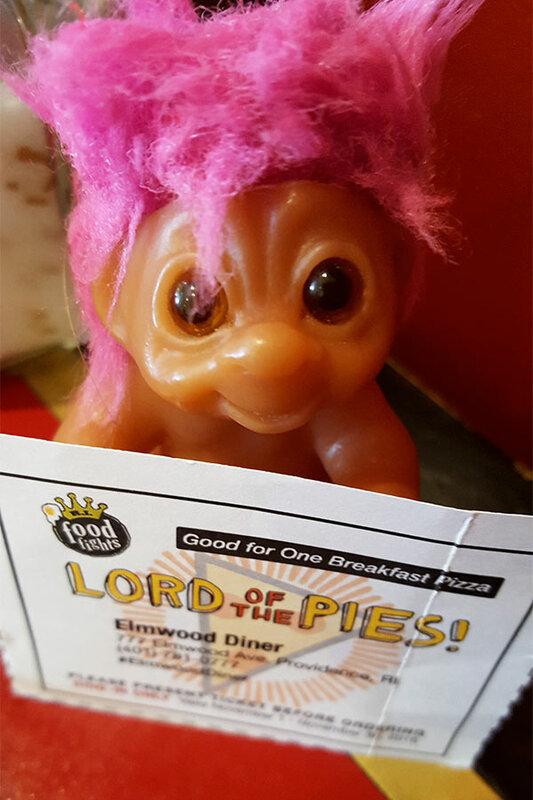 One of Moonie’s Lord of the Pies 2016 passport coupons was for Elmwood Diner. Moonie loves Elmwood Diner! As it was a nippy November day, his very first order of business was to ask our server, Debbie, for a hot chocolate made with milk. 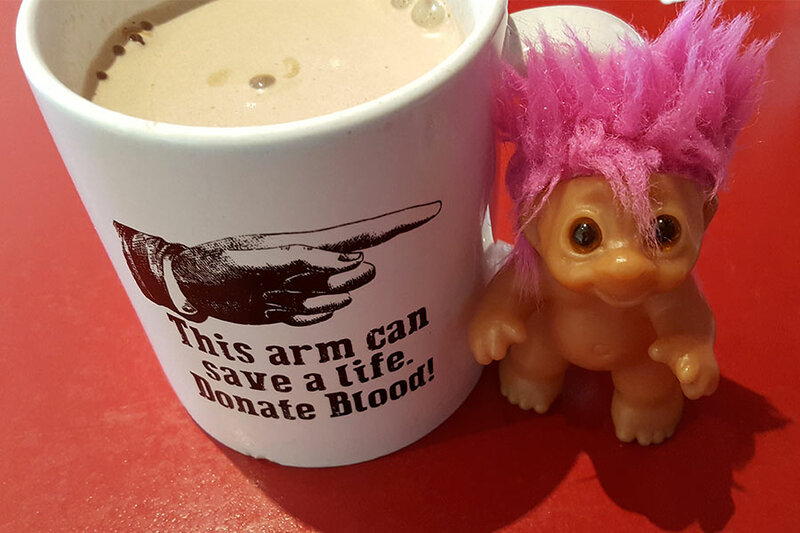 He giggled joyously when it arrived in a special mug for blood donors. Moonie loves donating blood, too! I placed our order for an Elmwood Diner breakfast pizza, which sounded delicious. Debbie asked if that was all. “Er, and a side of bacon for my companion,” I said. Soon Moonie’s little dish of bacon and our big breakfast pizza were delivered. 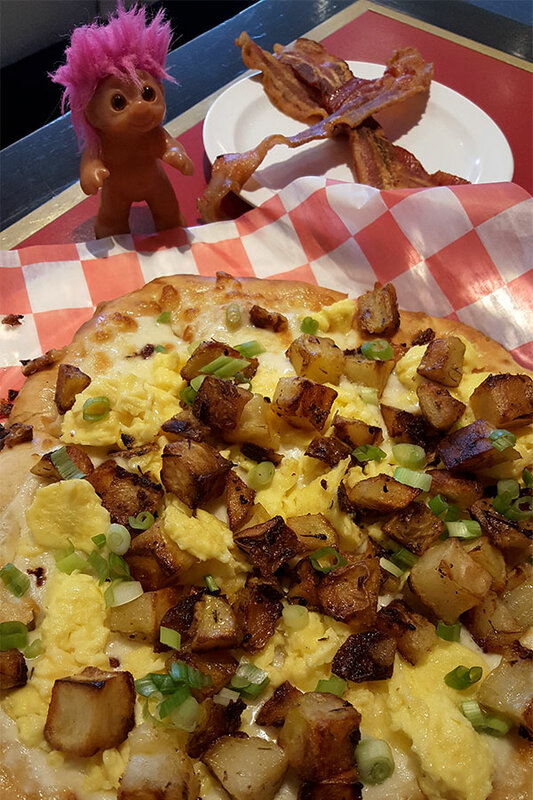 Both of our eyes widened at the delicious baked dough topped with scrambled eggs, home fries, scallions, and ooey, gooey cheese. “Ooooh!” Moonie said, staring at our meal. Once he stopped staring, it didn’t take my hungry little buddy long to dive into the bounty of breakfast pizza. Just minutes later, we were getting ready to leave…But I was having trouble getting Moonie to come with me. 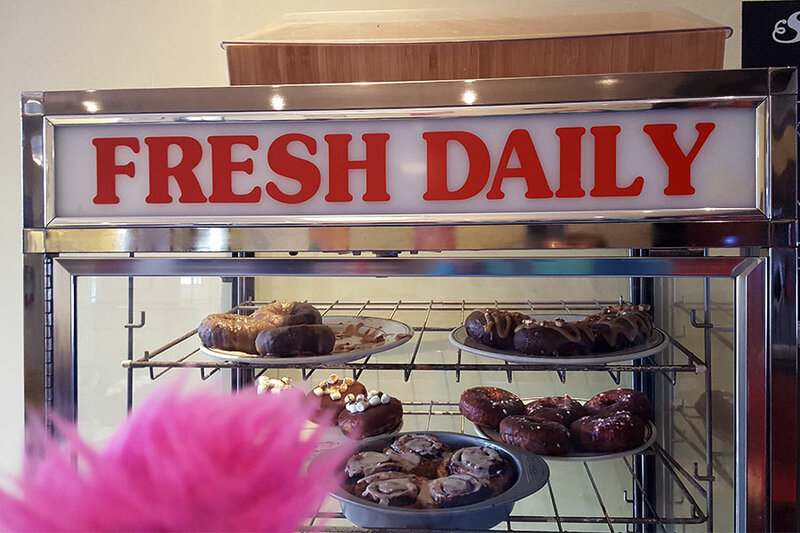 He’d discovered the case of fresh gourmet doughnuts and was drooling over its contents. I reminded my sweet-toothed pal that he already ordered his passport for to the Best Donuts in RI LoveFest, which is happening in February thanks to the great folks at RI Food Fights. That cheered up my pal immensely, and he waved goodbye to his friends at Elmwood Diner and skipped out the door, already dreaming of doughnuts.